West Ham are keen to sign German attacler Julian Brandt, with the Hammers set to bid £38million for the Bayer Leverkusen ace as the transfer deadline closes in, according to The Sportsman. The news outlet claimed on their website that Bayer Leverkusen are not keen to let one of their promising prospects go but West Ham are keen to sealing a deal before the 5pm deadline today (Thursday). 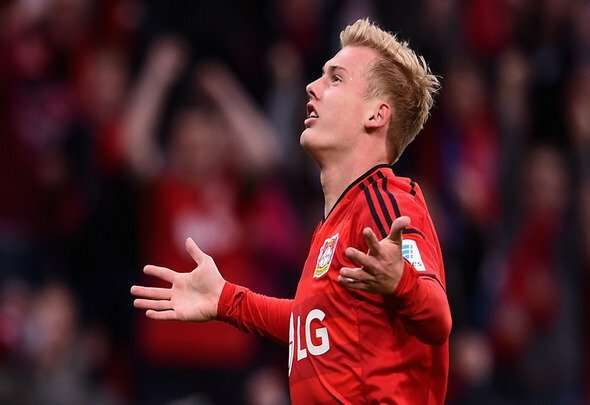 Brandt has played a key role in recent seasons for Leverkusen, making over 100 senior appearances for the German club and could be persuaded by the Premier League big spenders and the wages the Hammers could offer. West Ham have already brought in star names such as Felipe Anderson, Andriy Yarmolenko and Jack Wilshere but may not be finished yet. To the surprise of football fans, Germany manager Joachim Low opted to selecting Brandt for his World Cup squad over Manchester City winger Leroy Sane, who was coming into the summer tournament after a fantastic season with the Premier League champions. Brandt is a future talent and it would easily be a real coup if Manuel Pellegrini can convince him to join the Hammers. It is an ambitious move but it should not be ruled out given West Ham’s current transfer spree. The 22-year-old would be an exciting feature in the Premier League if the German were to complete a shock move to England. He has already attracted attention from the likes of Liverpool earlier in the window, emerging as a target after the Reds’ to pursue Nabil Fekir from Lyon. However, Brandt turned down a move to Anfield and committed his future to Leverkusen so it is unlikely that he will accept an offer to join West Ham, who are not guaranteed European football this season.